There were no perfect days as stage two of the Congressional Cup got under way Wednesday. Taylor Canfield, speaking for all said afterward: "We're still dusting a little rust off. We haven't sailed together with our crews in five months." That might partly explain why the top-ranked match racer in the world is in a three-way tie for third place with three wins in his first five matches, behind early leaders GAC Pindar skipper Ian Williams of the UK and Australia's Keith Swinton, each at 4-1 following opening tests of the first round-robin. Thirteen more flights remain on the Long Beach outer harbor over the next three days to determine the four semifinalists who will mix it up Sunday. Total prize money is US$75,000, with $17,500 to the winner through $2,000 for last place. Their last Grade 1 event was the Monsoon Cup windup of the Alpari World Match Racing Tour in late November, won by New Zealand's Phil Robertson, who is hanging on alone at 2-3, ahead of the misplaced classy company of past winners Johnie Berntsson of Sweden and Simone Ferrarese of Italy at 1-4, alongside local hopeful Scott Dickson. As a southwest breeze built from a feeble 3 1/2 knots to 10, Williams, the winner in 2011 and 2012 and still ranked No. 2, opened with four victories over Bruni, Swinton, Berntsson and Ferrarese until running into - almost literally - Richard in Wednesday's final flight. The Frenchman, the 2007 winner now ranked No. 5, forced Williams behind the race committee boat in the final minute, and by the time the Brit recovered Richard had a 16-second jump off the line. "For sure, we have to work on our starting," Williams said. Richard lost his first two matches to the veteran Dave Perry, coming off a strong effort in the preceding stage one event, and Dickson - the latter's only win. Then he beat Bruni and Berntsson before blitzing Williams to jump back into early contention. 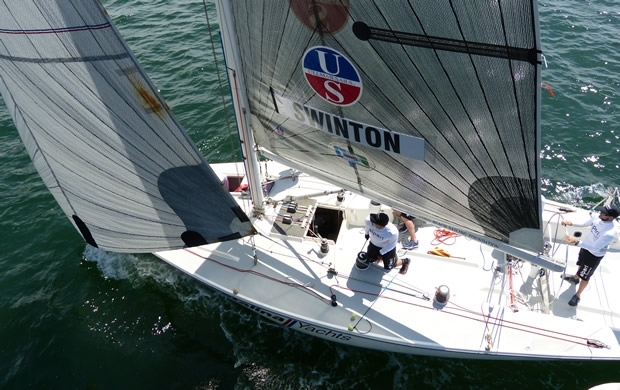 And if Swinton seems like the only frontrunner besides Canfield who hasn't won the Congressional Cup, he's working on it. Since placing eighth in the Monsoon Cup he has rebuilt his team by changing two of his five crew members for an all-Aussie outfit, except for pitman Tudur Owen of Wales. He also has taken on a new tactician, Ben Lamb, who said, "I really haven't done that...but we came from behind twice to win today." Still, Swinton dismissed a suggestion that this week was a bit like training camp. "I wouldn't say that," he said. "We were good off the [start] line in most of the races and usually came from behind when we had to." 8. tie among Simone Ferrarese, Italy; Johnie Berntsson, Sweden, and Scott Dickson, U.S., 1-4.